Edwards caught 59 passes for 904 yards (15.3 avg.) and 10 touchdowns in college, including 44 for 565 yards and four TDs as a senior in 1947. He was chosen by the Pittsburgh Steelers in the first round of the 1948 NFL draft (ninth overall) but signed with the Brooklyn Dodgers of the AAFC and had a quiet rookie year with a poor team, catching 23 passes for 176 yards. With the dissolution of the Dodgers in the offseason, Edwards joined the Chicago Hornets and was more productive with 42 pass receptions for 573 yards and three TDs in 1949. 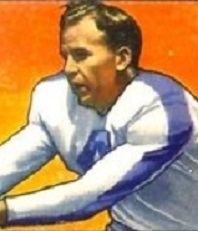 The AAFC folded after the season and Edwards moved on to the Yanks of the NFL for 1950, where he started at right end in a potent passing offense. Yanks went 7-5 to finish third in the NFL National Conference while placing second in the league in passing yards (2653), total yards (4485), TDs (51), and scoring (366 points). With the loss of starting QB George Ratterman in 1951, the Yanks dropped to last place and Edwards had a lesser season, catching 39 passes for 509 yards (13.1 avg.) and three touchdowns. The club folded and once again Edwards was forced to move as a result. He joined the replacement franchise, the Dallas Texans, for 1952, but appeared in only one game with the ill-fated club. Edwards spent the next two seasons with the Baltimore Colts and caught a total of 75 passes for 843 yards (11.2 avg.) and four touchdowns. He left for the CFL in 1955 and was with the British Columbia Lions for the last three years of his career, catching a total of 105 passes for 1710 yards (16.3 avg.) and six TDs. He was a first-team All-WIFU selection in 1956. Overall in the AAFC Edwards accounted for 65 pass receptions for 749 yards (11.5 avg.) and three TDs and in the NFL caught 169 passes for 2149 yards (12.7 avg.) and 13 touchdowns. The 1950 season remained the only one in which he received All-NFL and Pro Bowl honors. Edwards went into coaching in Canada, including a stint as head coach with British Columbia in 1958.